It was announced on September 28, 2015, that the Mayor’s Office, Penn Plaza Tenants' Council, and LG Realty had agreed to a deal that provides some relief to over 200 households threatened with immediate eviction. The tenants fought an excellent fight and we proudly stand with of our friends and neighbors in Penn Plaza. However, as part of this deal, the City agreed to sell Enright Parklet to the developer, who intends to transform it into a “pedestrian friendly” retail street, with housing above. This deal harkens back to top-down approach of 1960s urban renewal that the community has been working to undo for many years, and removes precious public space from common ownership. What is Enright Park and Why Does it Matter? Enright Parklet is one of only a handful of public parks in East Liberty and is by far the greenest and lushest park, lined with majestic oak trees that date back to the 1920s and 30s when it was originally a tree lined residential street. 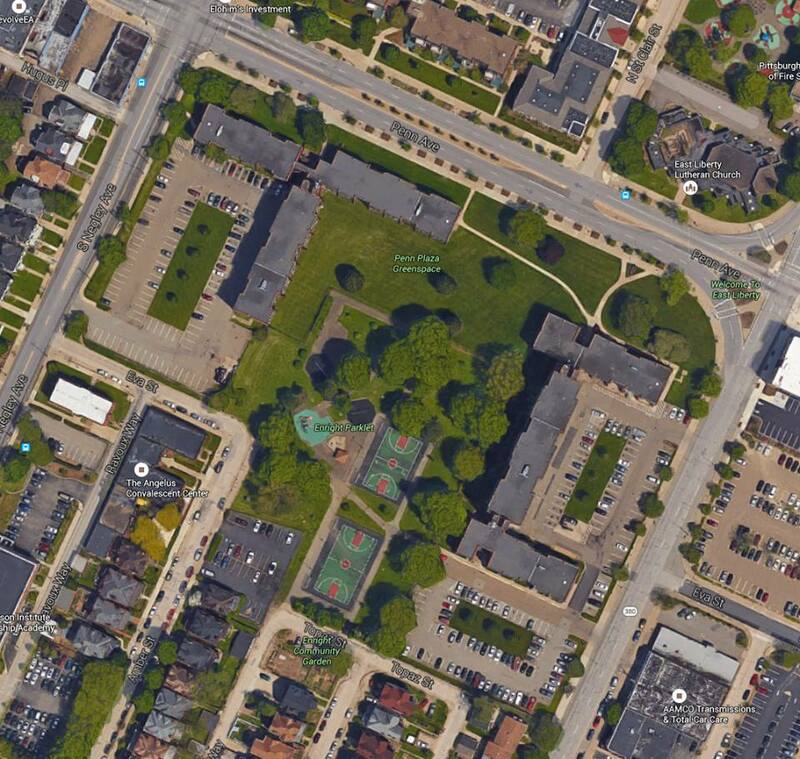 It holds two of East Liberty's three public basketball courts, as well as a playground and a modest spray park. A remnant of the 1960s urban redevelopment of East Liberty, it has come to be much beloved by residents of East Liberty and nearby Friendship and Garfield. In recent years, an adjacent community garden, sponsored by Whole Foods, has been developed to work with community youth and provide fresh produce to local food pantries. In a high-density community filled with apartments, Enright Parklet serves as everyone's backyard, a place for barbecues, birthday parties, pick-up basketball, and simply lounging under a tree with a good book. If a public space can be sold without a community plan in our neighborhood, it can happen in your neighborhood. the smaller trees and open space are the property of LG Realty. 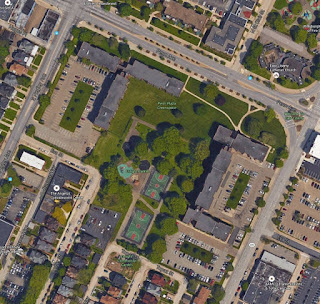 East Liberty can have both affordable housing AND public parks. The rights of the Penn Plaza tenants are established and will not be impacted if the sale of the public park is stopped. Commitments to REAL plans for affordable housing in East Liberty have been made and will be honored. It is time for the larger community to save one of the few remaining public parks in East Liberty and ensure that is remains a public space for every resident, a true commons in our thriving neighborhood. The developer intends to fast-track this deal, and hopes to have ownership of the park in early 2016. There is a limited window of time to mobilize and save the park for everyone, and to demand community involvement in planning for its future. PROTEST the rezoning of the Park from a residential zoning district to a mixed-use commercial district. This requires action and approval at both Planning Commission and City Council. Make your voice heard by signing this petition, writing to both Commission and Council, and by showing up at public hearings. STAND FIRM against the sale of a public community asset to a private developer. The sale will require action and approval by City Council and the Board of the Urban Redevelopment Authority. Call and write your councilperson to let them know that the sale of public parks for private development is unacceptable. An on-line petition will be going live soon. GET INVOLVED in planning parks and public space in East Liberty and beyond. VISIT Enright Parklet, located at the intersection of Eva Street and Amber Street in East Liberty. Bring your basketball, your bike, your picnic basket, or a good book!